I posted an offhand observation about a couple pages I disagreed with in The Bilingual Edge: Why, When, and How to Teach Your Child a Second Language , by Kendall King and Alison Mackey. I thought I should return to the book as a whole and give it a fair shake of a review. It's due back at the library today, so no time like the present! So, to sum up, I really like this book. I think it's written fluidly and accessibly, with lots of real-life examples and acknowledgments of real-life struggles. It doesn't attempt to push parents into a certain bilingual mold (e.g., "You must do One Parent, One Language, or else!!! "), but it does gently encourage practices that have a proven track record of increasing bilingualism. As a monolingual (attempting) raising a bilingual baby, I was initially resistant to use an OPOL setup, for fear of feeling tongue-tied in German and excluding my husband from conversations. I settled on a Monday-Wednesday-Friday course for when I would speak exclusive German to my 23-month-old. Mikko also attends a German immersion preschool for two half-days a week so that it's not just me babbling at him. I found this book's gentle acceptance of my plan just the sort of encouragement I needed to prompt me to add to it. If the authors had been more preachy and insistent, I might have just given up altogether. But they use common sense to point out, first of all, that there are different levels of bilingualism, and a lower level might be sufficient for you and your family. They also point to statistics that show that as little as 20 percent total exposure in a language (e.g., 2.5 hours a day for a 2-year-old who's awake for 12 hours total) can produce quite a productive speaking vocabulary. (I have to decide if and how well I want Mikko eventually to learn to read and write German, but that's for another day.) I realized that I could do even better than that paltry amount, and yet that I'm not too picky about what sort of language competence Mikko ends up with, so I felt encouraged and inspired to interact as much in German as possible (and as remained pleasant for both of us). I thought that a book called The Bilingual Edge might be on the uppity side, as in, Aren't we so smart to be bilingual? As a monolingual, hearing things like that makes me feel like I'm being talked about as some sort of doofus while I'm in the room. Sure enough, the book starts off with a summation of the research showing how many advantages there are to bilingualism, but it wasn't presented in a snooty tone. In fact, I kind of skimmed that chapter, because it didn't really go too in depth. The bulk of the book is concerned with the nitty-gritty of how to do bilingualism, and the why is accepted, either due to the reasons outlined up front or, as I'm prone to thinking about it: Why not? Every good bilingual guide will include a debunking of bilingual myths, and this book is no exception. The authors do a good job of shooting down objections to raising children bilingual, such as that exposing them to two or more languages will confuse their young brains, that errors should be corrected immediately and ruthlessly (not true in any language! ), that children should never mix languages, that bilingual kids will be late talkers, or that plunking them in front of a DVD will do the language-teaching job for you. An interesting chapter in this book deals with myths about when language learning must start. It's become common lore that young children learn language better and faster than adults or even older children, that there's a developmental "window" to become truly proficient in another language. The authors take apart this myth and will make you breathe a big sigh of relief if you ever thought it was hopeless to try learning another language at your advanced age! They explain that there are advantages and disadvantages to language learning at any age, and that the different age groups simply learn differently, but they can all end up at roughly the same destination. The one thing that does seem to be age-determined is native-like accent. It does seem that the brain can process accent better the younger the child, so it might partially be this aspect that convinces people that children are speaking better than the late-learning adults, who might sound clunkier in the second language. Beyond that, the authors point out that children learning a language have several advantages in that the complexity of the language being presented to them is rather low, and that children on the whole are less self-conscious and more accustomed to looking foolish (without feeling foolish) and attempting things without fear of failing. The older we get, the more we guard ourselves socially. So a young child might immediately start babbling with friends in a different language, the vocabulary of hide-and-seek not being that difficult to pick up. Whereas an adult thrown into a foreign situation might find herself needing a very specific professional or social vocabulary to be able to give a presentation at work or converse about politics at a cocktail party. So it might seem that the child is learning faster, but it's simply a whole 'nother set of circumstances. Anyway, I found all this fascinating and encouraging for my own growth in German and perhaps some other languages down the line! And it also assuaged any guilt I felt at not being fully bilingual in my raising of Mikko thus far, because the authors' consensus is it's never too late. Since the book encourages language learning at any stage, it also gives pointers for how each group might prefer to learn. 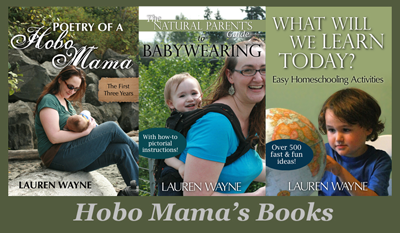 Younger children, like my toddler, learn best by immersion, exploration, and self-correction. Older children and adults can benefit from having more concrete grammar lessons, so they can see the structure of the language. I know Sam and I both have benefited from knowing how a word is spelled to help remember and pronounce it, but obviously that would be of no use to a baby. 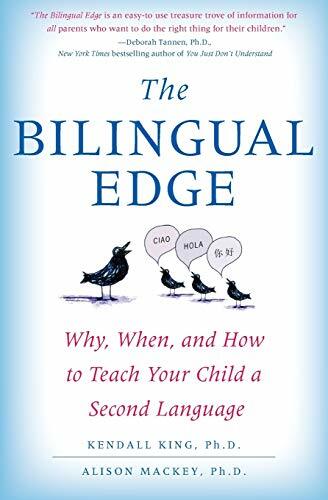 The Bilingual Edge also has practical tips and worksheets to audit your family's use of a language, the resources available to you, and your goals for the language, so that you can make changes based on what you've learned. I haven't done any of this hard homework, by the way, but just thinking about it has made me more aware of a desire to step up my game. I've been ordering some cheap German children's books I can find online (such as on Half.com ), and I downloaded some good German children's music from Amazon and put it on our iPod rotation. Another insight that seemed unique to this book is looking at what way your child learns best, for instance, through movement or through visual stimulus, so that you can adapt the language learning to suit that style. Another unique suggestion in the appendix was a plan for making a language-oriented scrapbook to celebrate your children's achievement in the target language. Less unique but still undoubtedly helpful, there are practical responses to when your extended family, or your own children, put up resistance to learning another language. In general, the book affirms that bilingual families and children come in all sorts of flavors and suggests strategies for each type. There are families who speak the majority language at home and others who speak the minority, and each might require taking a specific tack. The book also gives tips to account for birth order and gender differences, and to help children who have particular personalities and levels of language aptitude. This point is not about this book in particular, but I've found that reading books like this, and websites of other bilingual fans, and meeting the parents at my son's school, helps me see myself as part of a larger population, instead of a lone linguistic freak. The preschool Mikko attends has quite a few children with one or both parents as non-native German speakers, so that's encouraging for me. (1) Does it have the basics covered? That is, does it debunk myths, present benefits of bilingualism, give advice on how to make bilingualism work, and suggest solutions to common problems? In other words, if someone were to buy only one book on bilingualism, would this be a good enough fit? Then, (2) Is there something about this book in particular that makes it stand out? That is, if someone were to buy many books on bilingualism, should this specific one be included for some unique slant or information that other books lack? I think The Bilingual Edge does a good job with both (1) and (2). As far as basics, it seems to have covered them competently. For the second point, I've noted a few unique angles that this book gives. I also think it's admirable in being well written and organized—a good level of readability, not talking down to its readers but not straying too far into dry scholarly prose. So there you have it. I'm in the middle of reading several others and will post my recommendations as I manage!